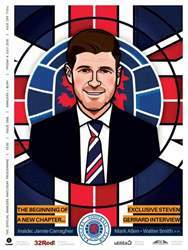 Tonight's first matchday programme of the 2018/19 season features an exclusive interview from new manager Steven Gerrard. Jamie Carragher and Walter Smith also speak about the new boss in the Ibrox dugout. There is an extensive preview on tonights opponents and we also catch up with Colin West.